To get our program to work, we first need to create a reference to a new instance of Word, then use this to create a document. Finally, we need to loop over our cells typing the values of each into this new Word document. So which is better? The short answer is the second one, I think, because it's simpler - but it does have implications. What follows is a fairly technical summary of what these are. Consequently you can never explicitly test if WordApp is Nothing because the instant you do, the variable is instantiated. IMHO you don't need to worry about this, but at the owlery we try not to gloss over things! 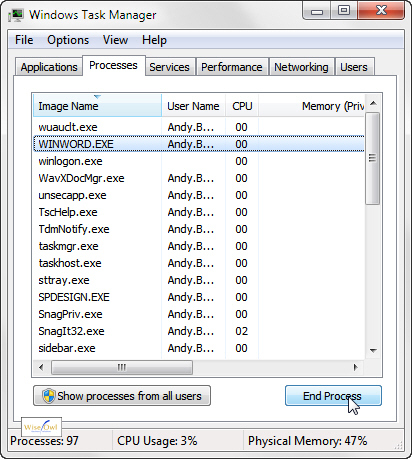 Select the running copy of MS Word - called WINWORD.EXE - and end the process. Note that the copy of Word you've created programmatically will NOT show up in the Applications tab of this dialog box. MsgBox "You should now see your jugglers in Word!" It is vital that you include the WordApp object at the start of every Word VBA command, as explained below. Excel will start from the top and work its way down in order. It will find the word Selection within the Excel object library before it finds it within the Word one, and so assume that this is a built-in Excel object. 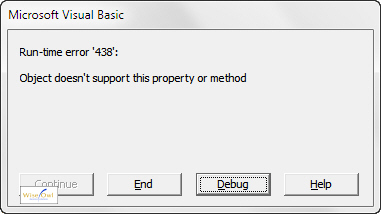 The error message you will get if you try to run the macro without prefixing the Word Selection object. In theory you could change the order of the references to put Word above Excel, but apart from being terrible practice - after all, you're coding within Excel - this isn't actually possible (you get an error message if you try to demote Excel in the references list). Now we've got all of the theory out of the way, let's look at a worked example of how to get an Excel workbook to fill in a Word form.